Detroit Army: A GRAY FOX IN DOWNTOWN DETROIT? My girlfriend and I saw Minnie Driver last night. We also saw what I believe was a Gray Fox. Sorry Minnie, the fox wins. How do you like them apples? After eating dinner at Eph McNally's for the Detroit Synergy Diner's Club, my girlfriend requested that we take a look at the filming occurring at the old Wayne County Building for an upcoming Hillary Swank/Minnie Driver movie. Within minutes, Minnie Driver hopped out of an unmarked white van (oooh they really tricked my girlfriend, me, and the 0 other people around) and my girlfriend nonchalantly said, "Minnie, welcome to Detroit." She said thank you and something about being cold, which is really completely unimportant because moments later was when I saw the "big cat", stealthily sneak through the night around the South end of the building. As it scampered into the bushes though, I could tell that it wasn't a cat at all. Laying on my stomach on the old Wayne County Building lawn, I could see that this animal was a canine, and not in the form of a domesticated dog. As much as I cringe at giving those annoying independent movie makers more ammunition in their continuing "artistic" quest to show the world how the city of Detroit is returning to its roots and reverting back to prarie land, I must admit that it was immediately apparent that this animal was wild. A member of the film crew shone his flashlight on the animal, which showed a gray coat, and a black stripe on its tail. Now after hearing about the animial's colors I know you're all thinking, "This guy is an idiot, it was a raccoon." Listen, I know what a racoon looks like, and this was no raccoon. 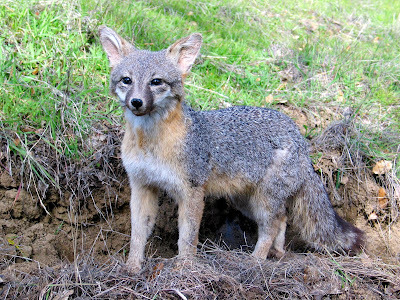 After doing some due dilligence, I found that the Gray Fox is found throughout North America and is distinguished by its gray coat and black striped tail. After examining a picture of the Gray Fox online, I'm sure a Gray Fox is what I saw. Unfortunately, I was only able to get close enough to the fox to take a picture while it was under the bush. Of course, once it was out in the open, my camera froze up and the lens would not emerge. 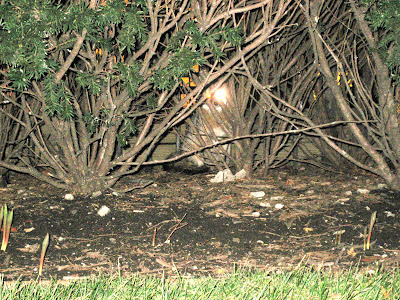 Below I've posted a picture of a Gray Fox in the wild, and subsequently the picture I took of the fox below the bushes that night. It's extremely hard to see the animal in my picture, but its two eyes are unmistakenly seen glowing from the reflection off of my camera's flash. Is there any possibility that I have even the slightest idea about what I'm talking about? Let me know what you think, but trust me, it wasn't a raccoon, damnit. Update 3/15/09: A friendly reader of Detroit Army did me a favor and lightened up the picture I took through photoshop. While the fox is still hard to make out, the lightened picture does make it slightly easier to see the animal hiding behind the bushes. Wow! Wish I could have seen it, too!